Shoes do not need to be shined on a daily basis, weather depending. Generally, the most often that wearers should shine their shoes to maintain an untainted appearance is once a week. Oiling is done less frequently as it can gradually degrade the leather, despite giving it a temporary improvement. Given regular light maintenance, a good pair of dress shoes will last you for many years. Here we’ll be taking you through the steps required in order to maintain your dress shoes. To give yourself peace of mind, it’s best to take care of the maintenance of your own shoes, rather than taking them to a cobbler or professional shoe shiner. Certain types of leather can be extremely temperamental regarding oils and polishing, making it far better to treat your own shoes. To put together your own shoe shining kit you need five basic pieces of equipment. Here we’ll be discussing each. You need at least one wide shine brush and one dauber style brush, for use with a leather cleaning agent. The polish gets applied with the dauber, whilst the wide shine brush is used to brush off dirt prior to applying the polish, and to rub up a shine. A separate dauber brush is needed for every color of polish which you use. A soft cloth is needed to apply cleaners, conditioners, and creams to your shoes. A cloth will also be used to buff up a shine, polishing your shoe to a near-mirror finish. There are special clothes readily available; however, one truly doesn’t need more than an old cotton T-shirt cut into strips. A different rag needs to be used with every product to prevent cross-contamination. A good leather cleaner will be able to clean off foreign substances and dust which conventionally would become trapped under the polish layer, damaging the leather of your dress shoes. A cleaner will also prepare your shoes to be treated with moisturizer, causing the excess oils and polish present on the leather to be removed. Leather cleaner should not be used too frequently as it can degrade the leather. If you can’t afford a professional, commercially produced leather cleaner, then make a blend of olive oil and vinegar and clean your shoes. Regardless of which cleaner you use, only resort to using it if your shoes have developed a dull, scuffed appearance. When leather dries out it becomes extremely brittle. This drops its water-resistance and its breathability. The best way to tell if your shoes need leather conditioner is to run your finger across them, feeling for any form of roughness. If your shoes are rough to the touch, be sure to treat them with a good conditioner to protect them from the elements, while building a good base for a polish patina. There are two basic types of shoe polish available. Cream polishes are used to restore color when your shoes have faded, while wax polishes are more commonly used. Use a wax polish to build up the conventional shine, while a cream polish is recommended prior to conditioning. Some professionals even recommend that you apply a coat of cream polish before buffing up a shine with wax. It is best to experiment and find the polishing order or routine which is best for you. Always keep cream and wax polish for the best results. Begin by using a buffing brush to clear away all dirt lodged onto your shoe. 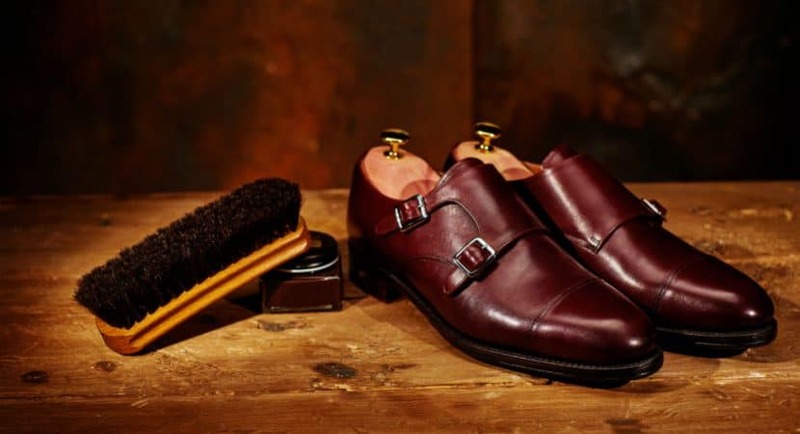 If your dress shoes have a stubborn polish residue, then be sure to clean it off with leather cleaner; otherwise, resort to using nothing more than a soft cloth dampened to wipe them down. Laces are best removed before cleaning. As a general rule of thumb, it is best to first apply a layer of leather cleaner. Leather cleaning agents go a long way so resist the urge to apply superfluous amounts; just a small amount will do. After applying your conditioner, allow your shoes to rest for about twenty minutes. This allows the conditioner to be fully absorbed. After about twenty minutes have elapsed, take a fresh soft cloth and apply some polish. Rub the polish onto your shoes using a circular motion, applying the polish sparingly. You need to apply as thin a layer as possible, applying a second layer if needed after allowing the polish to dry for roughly twenty minutes. You then need to use a horsehair brush, preferably of the dauber variety, to rigorously brush off any excess polish. Only a light film of polish should be left. A separate soft buffing cloth can then be used to buff up a shine using circular motions. Many find that dampening the cloth and applying a tiny amount of polish works wonders for building up a mirror finish. For those who are looking to add the perfect finishing touch to a shiny pair of shoes, consider opting for a product called edge dressing. This will keep your sole and heel matched to the shine of your shoes. You only need to polish your shoes once every few weeks. Do not polish your shoes too frequently or you may end up degrading their appearance far quicker than is necessary. Suede and Nubuck leather requires a specialized cleaning product. Any other oils or cleaners are highly likely to ruin your shoes completely. The best way to get rid of dirt and smudges on a pair of suede or Nubuck leather shoes is to rub the marks away using a rubber eraser. Be sure to rub in one direction only, otherwise suede will discolor into distinct contrasting shades, marring the appearance of your dress shoes. Wire brushes and polish are never to be used on suede or nubuck. It is best to always treat these types of shoes with a silicone spray after cleaning to help with weatherproofing and stain resistance.